Eine Factory Sealed 2015 Topps Chrome Baseball Hobby Box mit 24 packs per box, 4 cards per pack. 2 Autogramme in jeder Box !!! 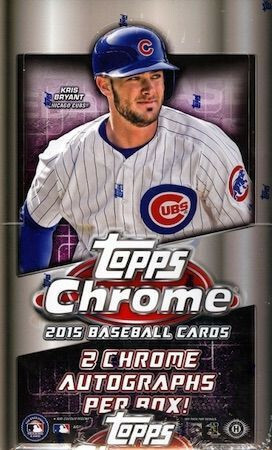 Produktinformationen "2015 Topps Chrome Baseball Hobby Box MLB"
Auf dem Box Cover befindet sich Kris Bryant - Chicago Cubs Rookie Superstar !!! Key Rookies: Kris Bryant, Joc Pederson, Carlos Correa, Byron Buxton, Addison Russell, Joey Gallo, Francisco Lindor, Carlos Rodon, Rusney Castillo, Noah Syndergaard, Yasmany Tomas, James McCann, Edwin Escobar, Archie Bradley, Blake Swihart, Jorge Soler, Daniel Norris, Javier Baez, Dalton Pompey, Jung-ho Kang, Maikel Franco, Steven Moya. Each hobby box of 2015 Topps Chrome Baseball will include two autographs! Red Refractor: sequentially #'d to 5. Highlighting a breakout performance from 20 of the game's brightest stars. Red Refractor: #'d to 5. Showcasing 20 rookies of the 2015 MLB class. Orange Refractor: sequentially #'d to 25. Featuring the Series 1 insert on Chrome technology. Featuring the top veterans and 2015 rookies of MLB. Highlighting upcoming MLB milestones and career accomplishments. SuperFractor: #'d 1/1. HOBBY & HOBBY JUMBO ONLY. Triple Autographs HOBBY & HOBBY JUMBO ONLY. The 200-base-card set will include the biggest stars from Topps baseball Series 1 and 2 on Chrome Technology, including 50 2015 rookies. Weiterführende Links zu "2015 Topps Chrome Baseball Hobby Box MLB"
Fanbewertungen für "2015 Topps Chrome Baseball Hobby Box MLB"